1. 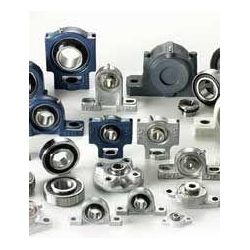 Pillow Block consist of the insert ball bearing and house, the inster bearing is the deep groove ball bearings with wide inner rings, it insert in housing work as an unit bearings. The housing are mainly casting or pressed steel. The bearing unit are compact in design with perfect sealing devices, they can align with easy during operation and can be conveniently mounted or dismounted. When mounted in appropriate housings to form housed bearing units, they are able to compensate for initial errors of alignment. 2. 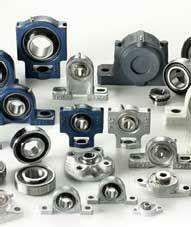 Simple and economic bearing arrangements can be made using the units. Because of their special characteristics, housed bearing units are used in agricultural machinery, construction equipment, conveyor systems, textile machines and fans as well as in machines for food and beverage processing and packaging. 3. Mounted bearing units do not permit axial displacement and are therefore unsuitable for non-locating bearing arrangements. The distance between bearing positions should thus be short, or the units should be attached to resilient sheet metal fabrications to prevent them from being subjected to excessive stressing, for example, as a result of thermal elongation of the shaft. 1) Radial insert bearings are particularly easy to fit. They are located on the shaft by means of an eccentric locking collar, grub screws in the inner ring, an adapter sleeve, drive slot or fit. 2) The radial insert ball bearings are integrated in the housing units. In order to ensure correct function and operational reliability in all operating conditions, the bearing and housing are matched to each other. 3) Housing materials: Cast iron pillow blocks / cast iron plummer blocks / sheet steel housings / plastic housings / stainless steel housings.